A cooling and warming mattress topper, CLIMSOM© is the first mattress topper that allows you to cool or warm yourself for rejuvenating sleep and new well-being at night. Simply choose the temperature for your comfort at bedtime and during the night from 18° to 48° C (64° to 118° F). A - Place the mattress topper under your fitted sheet or even under your flat sheet. It is a 1 place (190 x 70 cm or 75 x 28 inches) or 2 places (190 x 140 cm or 75 x 56 inches) mattress which adapts itself to all bed sizes. B - Just connect it to the thermo-controller situated at the end of your bed or underneath it. This thermo-controller warms or cools water that circulates through a fine network of pipes secreted within the mattress topper. The easy installation and handling only take a few minutes. C - A remote control allows you to switch your CLIMSOM on and off from your bed. It also allows you to modify the temperature or to choose a delayed start time for your CLIMSOM. You can also access to these functions directly on the screen of the thermo-controller. Notions of temperature are subjective. After a few trials, each individual determines an ideal personal sleeping temperature. Comfort is the best guide to determine your perfect temperature. CLIMSOM allows choosing a temperature between 18° and 48° C (64° to 118° F). 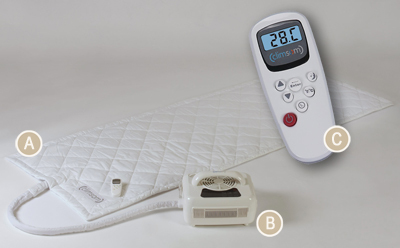 The most common temperatures chosen by CLIMSOM users are between 22° and 35° C (72° and 95° F). The heat and the coolness are created by "Peltier elements" in the thermo-controller. The water acts as a thermal vector inside the mattress topper. Therefore, contrary to electric blankets, you have no electric element on your mattress. That mechanism takes place near or under your bed. You benefit from a perfectly safe close environment. Every CLIMSOM is the object of rigorous quality control and European certifications. Its manufacturing is built to last. - read the user manual (PDF format).